If you are looking for a lot of bang for your buck then you need to come check this place out. 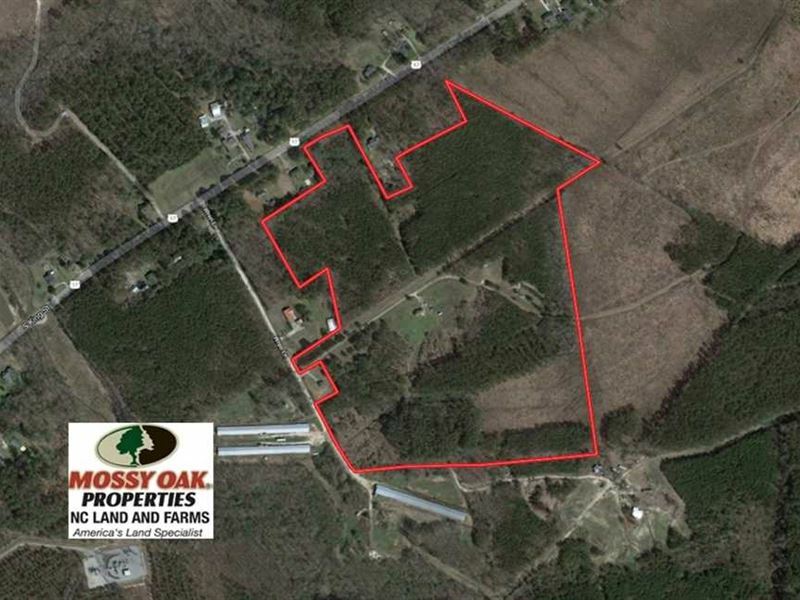 Located just south of US Highway 17 Bypass on the outskirts of the historic town of Windsor, North Carolina is this 59 acre hunting property with a house for sale in Bertie County North Carolina. Highway 17, known as Ocean Highway, is a main artery through northeastern North Carolina. It is a popular route for folks traveling up and down the Atlantic seaboard. So whether you are looking to relocate to eastern North Carolina or for an affordable hunting property for the family you need to check out all this tract has to offer. The 2-bedroom 1-bath home on the property was custom-built by the land owner. It sets over a third of a mile off the highway on over 7 acres of manicured open land. There is a covered porch on the front of the home as well as a ground-level patio on the east side of the home and a large deck on the rear of the home. You'll be able to find sunshine in the wintertime and shade in the summertime on one of these areas while you're having a meal or reading a book or just watching the wildlife. Whitetail deer, wild turkeys, squirrels and cottontail rabbits are all regular visitors to the backyard. There are three additional out buildings on the property. An aluminum storage building, a wooden barn and a small cook house overlooking a fishing pond. In the yard you will find fruit trees, ornamental shrubs and flowers, a raised vegetable bed, a grape vine and a really cool fire pit area. From a hunting aspect there are a number of paths and shooting lanes already established on the property and plenty of places to establish food plots. Bertie County is one of the top hunting counties in the state of North Carolina and harvesting game will be no problem here. The home can easily be used as a seasonal hunting camp. Most of the 50-plus acres of timberland are managed pine plantation which will produce income into perpetuity with periodic timber harvests. Come join me for a walk around this already cool property and let me show you how to turn this place into your own little piece of heaven on earth. Showings by appointment only. For more information on this and other Residential and Timber Land For Sale in Bertie County NC, contact at , by email at Email listed above, or visit nclandandfarms/. com.